Dr Robert Porges was received M.D. in 1886. He became friend with Queen Mother of Emperor Franz Joseph. Medical Center, married Joseph Eisner in 1998.
married Catherine (Katty) Opper (b. 10/03/1836, Blowitz, Bohemia). 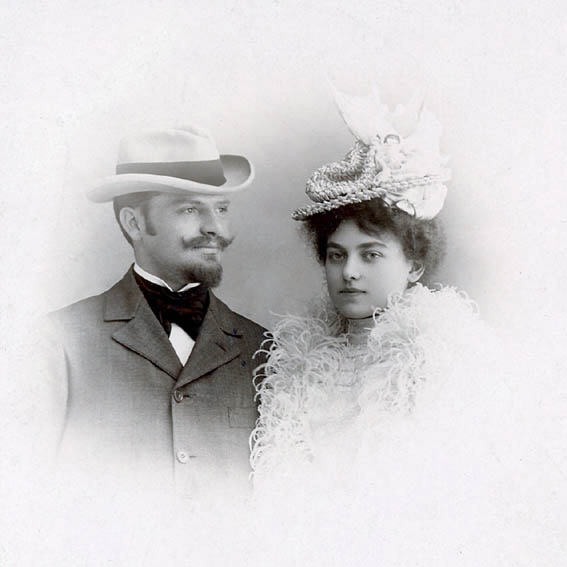 They lived in Vienna and had 5 children among which Fernand who emigrated from Vienna to Paris in the late 1880's where he founded a medical device factory. His brother Jules emigrated later. Almost all the Porgès living in France today are their descendants. The Strelisky dynasty : Lipót, his brother Náthán and his son Sándor can pride itself on its unique history. They were among the first in Pest to start practicing photography, since the Lipót the goldsmith became engaged in photography, and the popular and sought- after studio was in the family’s possession for nearly a hundred years. Throughout they remained within the field of photography, providing a reliably high standard, their work was reliably and consistently demanding and of high quality. 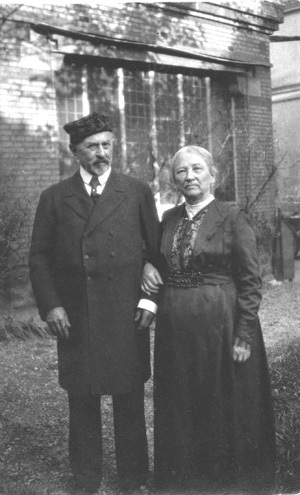 The Streliskys did not wish to convert from photographers into photo- artists, but every member of the dynasty was in possession of technical knowledge, the best methods, and they were brilliant masters of the photo making techniques. 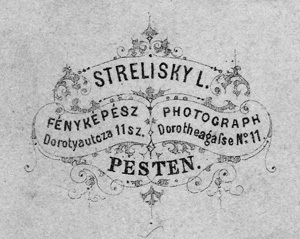 The Strelisky studio remained throughout with portrait photography: its pictures provide a wide panorama of Hungarian world of arts, the contemporary theatrical life, the aristocracy, bourgeoisie, thereby immortalizing their names in the history of Hungarian photography. (ETELKA L. BAJI: Streliskij. Strelisky. Hundred Years of a Photographer Dynasty. 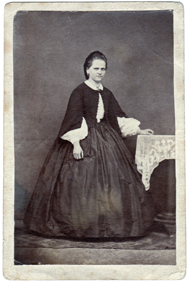 Bénédicte Mugnier (b. 1970 Paris) M.D. Frédéric Viet (b. 1969 Paris) Polytechnique (Paris), Ponts et Chaussées. married (July 2000) Valérie Sassetti. married (sept. 2001) Delphine Girbeau . Antoine Porgès (b. 1944 France), civil engineer, career in the medical device industry. (Studied architecture in Paris; married an Austrian officer and lived in Vienna. 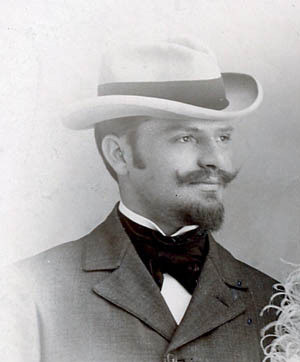 In 1886, Fernand Porgès emigrated from Austria, where he completed his scholarship, to Paris. He started working as a clerk for a Mr Low. From October 1887 to May 1888, he worked at the shipping department of Le Bon Marché, a large parisian department store. From May 1988 until 1893, he worked as a salesman for Mr H. Vergne, a manufacturer of medical catheters in the South West of France. 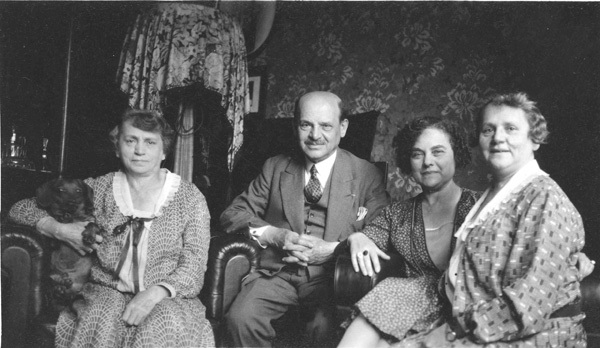 On December 10, 1893, he created his own company Fernand Porges & Cie in partership with Mr Low, to manufacture medical catheters with a factory in Sarlat (France) employing 40 workers. In 1899, he acquired the shares of his partner Low and became the sole owner of the company. 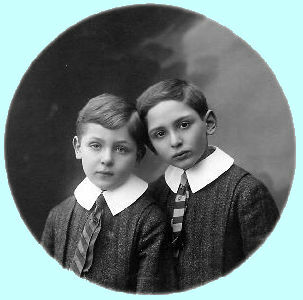 In 1902, he partnered with his brother Jeremie (Jules). (see below : Porges Laboratories ). 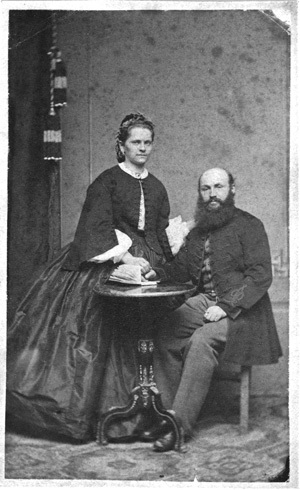 He married Cecile Theumann in Paris. She was the daughter of Jules Theumann, a Viennese emigrant who owned and ran successfully the largest Viennese Deli in Paris. Porges Laboratories were created in Sarlat (Dordogne, France) by Fernand Porgès on December 10, 1893. The company manufactured medical catheters for urology and surgery. The process consisted in weaving silk to make tubings that were dipped into gum, then marked, punched and hand polished. The company grew rapidly, mainly with export sales to eastern Europe. Jules Porgès, Fernand's younger brother, a sports journalist in Vienna, emigrated to France and joined the company. He later on obtained a 50% partnership, and acquired French citizenship in 1905. René and Lucien, the sons of Fernand, and Richard and Raoul, the sons of Jules, succeeded their fathers and managed the business very successfully. The company had offices in Paris (Bd Magenta) and two factories, in Sarlat and Les Lilas (Paris suburbs). During World War II, the company was seized by the German authorities. It was then fictitiously taken over by two ("righteous") friendly families who ran the business and gave it back to the Porgès family at the end of the war. After the war, the Porgès brothers established their head-quarters in Paris (25 Quai Anatole France) and restarted the business almost from scratch. They introduced polymers (PVC), a then revolutionary innovation in the manufacturing of catheters, in replacement of silk/gum or natural rubber. The company became rapidly a world leader in its specialty. In the 1950's, the processing of latex was introduced for the manufacturing of balloon catheters, which became the company's main production. In the late 1960's, Etienne (son of Lucien), Antoine (a son of René) joined the business. In 1974, a U.S. subsidiary was created in New York (54 W 54th Street) under the name of "Porges Catheter Corporation". In 1979, the company was sold to Synthelabo-Sanofi, the pharmaceutical susidiary of L'Oreal. At the time, it employed 600 people and shared the world market of medical catheters with C.R. 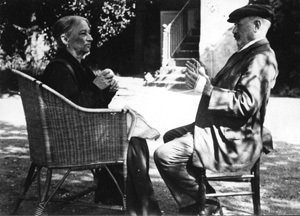 Bard (U.S.A.) and Rusch (Germany). To date, Laboratoires Porgès still exist under the same name, with manufacturing facilities in Sarlat and headquarters in the Paris area. In 2001, Synthelabo Sanofi sold Laboratoires Porgès to Mentor Corporation (USA). In 2006, Mentor sold Laboratoires Porgès to Coloplast (Denmark). To read more about Porgès Laboratories, click here. 138 Jewish families lived there in 1718 ; 153 in 1747 ; 251 in 1793 ; 313 in 1850 ; 1,347 persons in 1857; 1,148 in 1880 ; 806 in 1900 ; and 430 in 1930. Kolín was one of the largest and most important Jewish communities in Bohemia and was home to many prominent Talmudic scholars. was a Rabbi in Kolin, Dayan (judge in a Beit Din Rabbinical Court) of the Jewish religious community in Prague. When an epidemic of dysentery appeared in Kolin in 1660, Rabbi Borges and his son Schaje (Isaiah) were accused, June 25, of having killed a pig which had escaped from the house of the widow Sperlink into the Jews' street, and of having thrown the same into the communal well, thereby poisoning the water. Both fled from the city. He was a relative of Isaiah ha-Levi Horowitz, whom he followed to Erez Israel, settling in Jerusalem, where he became a scribe. During this mission he published, in Prague, Frankfurt and Amsterdam (1650), a small illustrated work "Darkhei Ziyyon" in judeo-german designed to arouse sympathy and obtain support for the Jewish community in Erez Israel. "However, it can be proved that the legation was not led by the Chief Rabbi of Prague, Simon Spira (1599-1679). 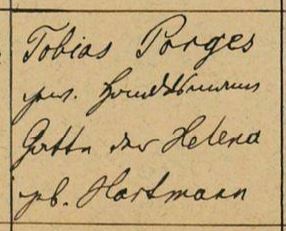 A possible emissary from among the important rabbis was Abraham ben Hirsch Porges (1619-1673), who was also Chief Rabbi of Kolin and Labem, Landserabbiner of Moravia and dayyan in Prague...."
No relationship was established between Rabbi Abraham Porges and the Salomon Porges family above, despite they all settled in Kolin. Its Jewish community is one of the oldest in the country. A number of Jews were living here in the fourteenth century, and they had their own synagogue. A stone inscription from a former synagogue, preserved in the present synagogue, bears the date 1642. When King Ferdinand I. expelled the Jews from Bohemia in 1541, the Jews of Kolin went with their movable goods to Poland. At Braunau the emigrants encountered thieves, who robbed them of 20,000 Bohemian schock. In 1551 the Bohemian Jews were permitted to return; but the Jews of Kolin could find no rest in their city. For unknown reasons King Ferdinand granted them safe-conduct in 1557, enabling them to remain for one year in the country to collect their debts, after which period they were to leave again. Their affairs delayed them, however, and they did not leave the city until 1561. After Ferdinand's death, in 1564, his successor, Maximilian II., permitted the Jews to return to Kolin; but the wealthiest among them did not avail themselves of the permission. In 1618 the Jewish community of Kolin was, next to that of Prague, the largest in Bohemia. It had to pay heavy taxes into the royal treasury; in 1618 the sum amounted to 18,000 thalers, or 47 thalers per head. In 1603 the municipal council forbade the Jews to appear on Sundays and other Christian holidays in those parts of the city inhabited by Christians; it prohibited them from keeping dogs; and forbade also Jewish butchers to sell meat to Christians. In 1611 a special prison was built in the Jews' street for the Jews, at their request and at their expense; it has only recently been demolished, after having served as a dwelling for poor families for more than one hundred years. No Jew was permitted to own any real estate except his house, for more than one horse. Jews were forbidden also to engage in those trades or lines of business in which their Christian fellow citizens were engaged; they were obliged, therefore, to establish connections with foreign houses. The municipal council, which was intent upon isolating the Jews from the Christian population, forbade the latter to enter the service of the Jews; even washerwomen were not allowed to do laundry-work for them. As the Jews were accused of having brought the plague into the city on returning from their business trips, they were not permitted to remain outside of their own street for any length of time, nor to draw water with their vessels from the Christians' wells. During this appearance of the plague (1613-14) the municipal council had both entrances to the Jews' street walled up. On Sept. 8, 1621, the Jewish communal director David was elected to the municipal council. 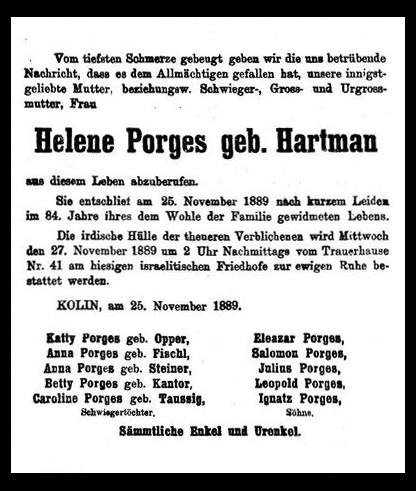 Various petitions which the council of Kolin sent to Prince Lichtenstein, with a view to interfering with the trades of the Jews, were not granted. In Dec., 1621, the knight Jan Vazlav Grizl of Grizlov was made captain of the imperial estate of Kolin and Bieberitz. He permitted the Jews to engage in those trades and lines of business which had hitherto been open only to Christians; and on several occasions he showed them favor. 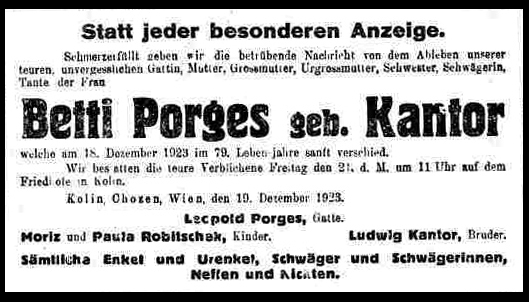 When an epidemic of dysentery appeared in Kolin in 1660, Rabbi Borges and his son Schaje (Isaiah) were accused, June 25, of having killed a pig which had escaped from the house of the widow Sperlink into the Jews' street, and of having thrown the same into the communal well, thereby poisoning the water. Both fled from the city. Jurisdiction and Organization. Empress Maria Theresa decreed, Dec. 18, 1744, that all the Jews should leave Bohemia by the end of the following month. In 1745 there were at Kolin forty-two houses belonging entirely to Jews and valued at 19,210 gulden. On June 12, 1745, a contract was made between the Jewish and the Christian community, that when the Jews left the country their debtors should remain in possession of such houses; but if the Jews should obtain permission to return within two years, the houses should be restored to them at a price to be fixed by valuation. The empress'decree was, however, rescinded. In 1750 three Jews of Kolin received from the municipal council the concession for the sale of tobacco in Kolin. During the dearth in the winter of 1846-47 the Jews of Kolin distinguished themselves by twice contributing large sums for the relief of 100 Christian families. The community for a long time had a primary school near the synagogue, in which Hebrew also was taught. In 1788 forty-one children attended the school, and in 1789 fifty. At present (1904) the Talmud Torah Society of the Jewish congregation also supports a school for the study of Hebrew and the Bible. The affairs of the congregation are administered by a board consisting of a president and seven trustees together with twenty-four members chosen from the congregation at large. Simon Oppenheim, author of "Nezer ha-Kodesh," middle of the eighteenth century; Jacob Illovi of Ungarisch-Brod, 1775-78; Eleazar Kallir, author of "Or Hadash" and "Hawwot Yair," 1780-1800; Wolf Löw Boskowitz, 1806-12; Wolf Löw, 1812-26; Joachim Deutschmann, 1828-36; Daniel Frank, 1839-60; Dr. Josef Gugenheimer, 1861-96; his son, Dr. Raphael Gugenheimer, the present incumbent. Location of New Cemetery: 1 km N in Veltrubska Street. Present population is 25,000-100,000 probably no Jewish population. •	Regional: Jewish Congregation: Mrs. Jana Wolfova, Zidovska Nabozenska Obec Praha, Maislova 18, 110 01 Praha 1; tel. 02/231-69-25. •	Caretaker with key: Mr. Sukop, in stone-masonry (Kamenictvi) near the Kolin Municipal Cemetery. Earliest known Jewish community dates from mid-15th century. 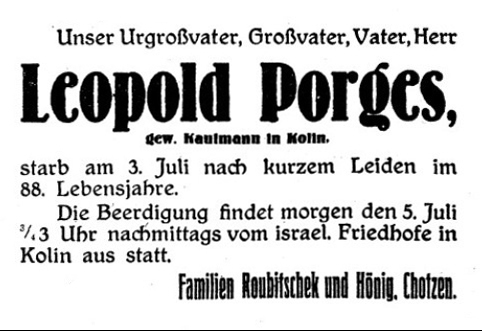 1900 Jewish popuation was 806. 1930 Jewish population was 430. Peak Jewish population was in mid-19th century with 1700. Jews moved to Prague and Vienna from mid-19th century through early 20th century. Noteworthy resident famous rabbis: Eleazar Kalir (about 1739-1802); Benhamin Volf ha-Levi Boskowitz (probably 1740-1818; Chief Rabbi of Bohemia nad Moravia, Richard Ferer (1875-1970); and American Orthodox Rabbi Bernard Illowy (1812-1871). The still active Conservative Jewish cemetery originated in 1887 with last burial in 1979. Libodrice, (Ger: Libodritz) 9 km away; Planany, (Ger: Planian) 13 km away; and Zasmuky, (Ger: Sasmuk) 14 km away, used this probably is unlandmarked cemetery. The flat suburban site, separate but near other cemeteries, without sign has Jewish symbols on gate or wall. Reached by turning directly off a public road, access is open with permission via a continuous masonry wall and locking gate. The Regionalni Muzeum holds Old Cemetery key. This Jewish cemetery originated probably in mid-15th century. Buried in the cemetery are Rabbi Bezalel ben Jehuda Liva-Low (1599, son of famous Rabbi Jehuda ben Bezalel Liva-Loew of Prague), Rabbi Kalir, and other rabbis with last known Conservative burial was 1887. The landmarked isolated urban hillside has Czech sign and Jewish symbols on gate or wall. Hamackova, Vlastimila and Sedinova, Jirina. The Old Jewish Cemetery at Kolin. Judaica Bohemiae, Volume 20, No.2, Prague 1984, pg. 112-124 translated from French by Edmund U. Cohler, excerpted here with permission of Edmund Cohler; ecohler@cspi.com. "The old cemetery is among the oldest and most important in Bohemia, with the settlement of Jews in Kolin going back to 1410. The cemetery was founded in the middle of the 15th century and was in use until 1887, when a new cemetery was founded at Kolin-Zalabi. The old Jewish Cemetery of Kolin is on the W of the historic city square of Kolin. It is an irregular polygon boardered by the streets Na Petrine, Slunecni, Prazska, Kmochova and Nad Zastavkou. A path, going from E to W and tranversing the entire cemetery, joins the gate on Kmochova Street to that of Slunecni Street. The cemetery is locked with a key which according to the instructions written on the gates, is at the disposal of visitors in the Regional Museum in the City Square. This museum also organizes the maintenance of the cemetery by volunteers. The tombs are grouped in irregular rows in a north-S direction. Inscriptions in general are towards the E.
In the eastern part are those generally dating from the 15th to the 19th century, not in chronological order. In the Western part are tombs primarily from the second half of the 19th century.
" The article continues describing the types of tombs found during which centuries as well as mentioning a few prominent stones. The earliest record of Jewish settlement in Kolín dates from the beginning of the fourteenth century ; a religious community and synagogue were probably active in the early fifteenth century. During the years 1541–1549 and 1561–1564, Jews were expelled from the town, but by 1574 some 33 Jewish men (and possibly families) lived there again. A communal record book, dating from 1598, has been preserved. The Jewish population of Kolín increased mainly in the seventeenth and eighteenth centuries ; in addition to commerce and textiles, local Jews also worked as garnet cutters and drillers. In 1653, Jews constituted 29 percent (roughly 390 persons) of the total population ; 138 Jewish families lived there in 1718 ; 153 families (670 persons) in 1747 ; 251 families (1,169 persons) in 1793 ; 313 families in 1850 ; 1,347 persons (17.4%) in 1857; 1,148 persons (10.1%) in 1880 ; 806 persons (5.3%) in 1900 ; and 430 persons (2.3%) in 1930. Kolín was one of the largest and most important Jewish communities in Bohemia and was home to many prominent Talmudic scholars. El‘azar Kallir (1728–1801) was head of the town’s famous yeshiva. In addition to maintaining a burial society (with statutes from 1610 and a book of minutes from 1795), there were more than 20 other societies and associations, including charity, educational, women’s, and Zionist associations. In addition, there was a Jewish sports club. In 1942, the Nazis deported 2,202 persons from the Kolín region to the Terezín ghetto. Of these, only 104 (4.7%) survived the war. Following World War II, the religious community was reestablished (a rabbi lived in Kolín until 1953), but it had only 15 members in 1966 and was dissolved after 1970. About half of the buildings in Kolín’s medieval Jewish quarter have been preserved, including a synagogue dating from 1642–1696 on the site of an earlier house of prayer. A cemetery with tombstones dating from the first half of the fifteenth century remains as well ; within it are graves of such famous rabbis as Betsal’el ben Yehudah (d. 1599; son of Maharal of Prague). A newer cemetery, established in 1887, contains a memorial to the victims of the Holocaust.